Only companies with at least VND80 billion (US$5 million) in authorised capital will be allowed to list in HCM City. State Securities Commission Chairman Vu Bang told reporters on the sidelines of a Listed Company Club and investors' meeting on Dec. 9 in HCM City that a draft decree to guide the Securities Law had been submitted to the Government. Under the decree, expected to be approved early next year, companies already listed but with less than VND80 billion in equity would have two years to increase their capital failing which they would be moved to the Ha Noi exchange. 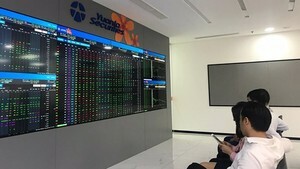 Bang said the HCM City bourse would target major institutions in industries like banking, insurance, and telecom. The Corporation for Financing and Promoting Technology (FPT) will list in HCM City on Dec. 13. FPT is a market leader in systems integration, mobile phone distribution, software production, and telecom and internet services. It recently opened a software engineering university.